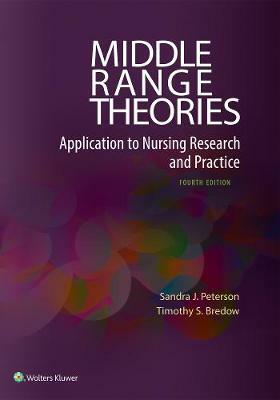 The most complete and detailed book devoted to middle range theories, Middle Range Theories: Application to Nursing Research and Practice examines theories and their applications in clinical nursing research and practice. In this fourth edition, the authors address this dynamic relationship with increased emphasis on applications of middle range theories to practice. Every theory chapter includes examples of the theorys use in research, its application to clinical practice and critical thinking exercises. The authors provide expert advice on selecting the appropriate theory for a nursing research project and developing the critical thinking skills needed to critique theories. Each theory chapter provides the nurse researcher with a variety of tools, updated from the earlier editions. Key features of the fourth edition include: - Brand New chapters exploring new concepts surrounding spiritual care. - Definitions of key terms to define concepts and aid the reader's understanding of theories. - New research studies, diagrams, and explanations to illustrate "The Arc"how theory improves practice and practice shapes theory. - Research Application boxes provide a sample application of the theory modeling the research process. - Critical Thinking Exercises at the end of each chapter engage readers in analysis of the theory and its application to practice. - Web Resources to aid readers and supplement research are provided. Features: - Definitions of Key Terms appear at the beginning of each chapter to define concepts and aid the reader's understanding of the theory. - Using Middle Range Theories in Research boxes provide examples of how the theory has been used in published research. These have been updated and reformatted, using an outline based on the research process. - Using Middle Range Theories in Practice boxes provide examples of theories applied to a specific clinical practice situation. They too have been reformatted so that the clinical issue and the use of the theory as a foundation for nursing intervention are clearly identified. - Examples of Theory in Practice tables are included in each chapter. The headings on these tables are similar to the matrix used to critique research as a basis for evidence-based practice. - Critical Thinking Exercises at the end of each chapter engage readers in analysis of the theory and its application to practice. - Instruments are discussed in the chapters, with specific examples available in the Student Resources located on thePoint icon (http://thepoint.lww.com/Peterson4e).